The state of Karnataka in South India has a rich diversity of flora and fauna. It has a recorded forest area of 38720 km2 which constitutes 20.19% of the total geographical area of the state. These forests support 25% of the elephant population and 20% of the tiger population of India. Many regions of Karnataka are still unexplored and new species of flora and fauna are still found. The Western Ghats mountains in the western region of Karnataka are a biodiversity hotspot. Two sub-clusters of the Western Ghats, Talacauvery and Kudremukh in Karnataka, are in a tentative list of sites that could be designated as World Heritage Sites by UNESCO. The Bandipur and Nagarahole national parks which fall outside these subclusters were included in the Nilgiri biosphere reserve in 1986, a UNESCO designation. Biligiriranga Hills in Karnataka is a place where Eastern Ghats meets Western Ghats. The state bird and state animal of Karnataka are Indian roller and the Indian elephant respectively. 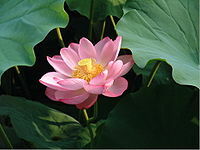 The state tree and state flower are sandalwood (Santalum album) and lotus respectively. Karnataka is home to 406+ tigers (around 12% of tigers in world). Karnataka has five national parks. This park is present in the Uttara Kannada district and spreads over an area of 250 km2. The altitude varies from 27 metres (89 ft) to 937 metres (3,074 ft), and temperatures from 15.5 °C to 45 °C. Average annual rainfall is about 4,700 millimetres (185 in) . Flora: The area has semi-evergreen and evergreen forests. Some common tree species in the area are Calophylluum tomentosa, Calophyllum wightianum, Garcina cambogia, Garcina morealla, Knema attenuata, Hopea wightiana, Tetrameles nudiflora, Alstonia scholaris, Flacourtia montana, Machilis macarantha, Carallia brachiata, Artocarpus hirsutus, Artocarpus lacoocha and Cinnamomum zeylanicum. Fauna: Mammals in the park include Indian elephant, gaur, wild boar, sambar, chevrotain, muntjac, chital, gray langur, bonnet macaque, slender loris, Bengal tiger, jungle cat, Indian leopard, leopard cat, small Indian civet, common mongoose, golden jackal, dhol, sloth bear, Malabar giant squirrel, grizzled giant squirrel, Indian giant flying squirrel, and Indian crested porcupine. King cobra, python, cobra, rat snake, viper and krait are among the snakes that inhabit the park. Interesting birds include the great hornbill, Malabar pied hornbill and Ceylon frogmouth. It is situated within Chamarajanagar district covering an area of over 800 km2 and adjoins the states of Tamil Nadu and Kerala. In 1973, Bandipur became one of the first of India's tiger reserves and became a part of Project Tiger. In 1974, intention was declared under the Wildlife Protection Act to notify it as a national park. Flora: The scrub jungles towards the eastern limits of the park consist of stunted trees, interspersed with bushes and open grassy patches. Towards its north-western fringes, there is a gradual shift in the vegetation from open dry deciduous forests to tropical mixed deciduous forests. These diverse habitats support an enormous diversity of animal life. It is located in Bengaluru district and covers over 260.51 km2 of area. Altitude varies from 740 metres (2,428 ft) to 1,034 metres (3,392 ft), temperature from 20° to 35 °C and the average annual rainfall is 700 millimetres (28 in). Flora: The area has dry deciduous forests and thorny scrub, with patches of moist deciduous forests along the streams. Tree species in the park include Anogeissus latifolia, Schleichera oleosae, Terminalia tomentosa, Terminalia arjuna, Grewia tilaefolia, Santalum album, Shorea talura, Emblica officinalis, Vitex altissima, Wrightia tinctoria, Randia sp., Ziziphus sp. and Albizzia sp.. Bamboos are common in the park, the dominant species being Dendrocalamus strictus. A small area of the park has plantations of Eucalyptus, Bauhinia purpurea, Samanea saman and Peltophorum pterocarpum. Fauna: Mammals in the park include Indian leopard, gaur, Indian elephant, golden jackal, fox, wild boar, sloth bear, sambar, spotted deer, barking deer, common langur, bonnet macaque, Indian crested porcupine and hare. A Bengal tiger has recently been sighted in the park. Spread over an area of 600.32 km2, it encompasses regions in the districts of Dakshina Kannada, Udupi and Chikmagalur. Altitude varies from 134 metres (440 ft) to 1,892 metres (6,207 ft). The park has a pleasant climate, with temperatures ranging from 17° to 28 °C. Annual rainfall varies from 1,778 millimetres (70 in) to 6,350 millimetres (250 in), with an average of 4,000 millimetres (157 in). The rivers Nethravati, Tunga and Bhadra are believed to originate here at Ganga Moola. Flora: The park has mostly evergreen and semi-evergreen forests. Shola grassland habitat is found at elevations above 1,400 metres (4,593 ft). Evergreen trees include Poeciloneuron indicum, Holigarna arnottiana, Artocarpus sp., Calophyllum sp., Alstonia scholaris, Canarium strictum, Syzygium cumini, Flacourtia montana, Symplocos spicata, Hopea parviflora, Mesua ferrea and Evodiaroxburghiana. There are also a few plantations of Eucalyptus, Casuarina and Acacia auriculiformis. Fauna: Mammals in the park include Bengal tiger, Indian leopard, dhole, golden jackal, lion-tailed macaque, common langur, sloth bear, gaur, sambar, spotted deer, barking deer, Malabar giant squirrel, Indian giant flying squirrel, Indian crested porcupine and mongoose. Reptiles are represented by snakes and tortoises. Bird species in the park include the Malabar trogon, great hornbill, Malabar whistling thrush and imperial pigeon. Also known as Rajiv Gandhi (Nagarahole) National Park gets its name from the Nagara Hole (Snake River in Kannada) which runs eastwards through its centre. Nagarahole river flows through the park before it joins the Kabini river that also acts as a boundary between Nagarahole and Bandipur. The park covers an area of about 575 km2. The Wayanad Wildlife Sanctuary of Kerala adjoins to the Southeast. Flora: These forests are dominated by teak and rosewood. The eastern limits of the park consist of regenerating dry deciduous forests. The west region of the park contains tropical moist and semi-evergreen forests. Interspersed with these forests are swampy fallows called hadlus, which are dominated by grasses and are favoured grazing areas of many wild herbivores. Fauna: Some of the species of mammals found in this park are Indian elephant (Elephas maximus indicus), gaur (Bos gaurus), sambar (Cervus unicolor), chital or spotted deer or axis deer (Axis axis), muntjac or barking deer (Muntiacus muntjak), chevrotain or mouse deer (Moschiola indica), four horned antelope (Tetracerus quadricornis), giant fruit bat (Pteropus giganteus), Bengal tiger (Panthera tigris), Indian leopard (Panthera pardus), leopard cat (Felis bengalensis), jungle cat (Felis chaus), rusty spotted cat (Felis rubiginosa), common palm civet (Paradoxurus hermaphroditus), small Indian civet (Viverricula indica), sloth bear (Melursus ursinus), dhole or Asiatic wild dog (Cuon alpinus) and flying fox (Pteropus giganteus), the largest Indian bat. Among the 300 species of birds identified in this park include herons, storks, egrets, ducks, kites, eagles, falcons, partridges, quails, peafowl, owls, lapwings, sandpipers, pigeons, doves, parakeets, cuckoos, nightjars, swifts, kingfishers, bee-eaters, barbets, swallows, larks, woodpeckers, shrikes and orioles. Reptiles include marsh crocodile (Crocodylus palustris), Indian pond terrapin, star tortoise, common Indian monitor lizard (Varanus bengalensis), forest calotes, southern green calotes, skinks (Mabuya spp. ), geckos, spectacled cobra, Russell's viper, common krait, Indian python (Python molurus), checkered keelback, green whip snake, common Indian bronzeback, flying snake, wolf snake and trinket snake. Adichunchanagiri Wildlife Sanctuary: This is located in Mandya district and is spread over 0.88 square kilometres (0.34 sq mi). This was created mainly for the conservation of peacocks. It also houses nearly 250 species of birds. Arabithittu Wildlife Sanctuary: This is located in Mysore district and is spread over 13.5 square kilometres (5.2 sq mi). This park consists of eucalyptus and sandalwood plantations. Leopard, fox and spotted deer are some of the animal species found here. Also around 230 species of birds have been observed here over the years. Biligiriranga Swamy Temple Wildlife Sanctuary: This is located in the Chamarajanagar district and is spread over 539.58 square kilometres (208.33 sq mi). Some of the species of flora found here are Anogeissus latifolia, Grewia tilaefolia and Syzygium cumini. Species of mammals include elephants, tigers, leopards, sloth bear, gaur, barking deer and sambar. Among the 215 species of birds found here include Nilgiri wood pigeon, Malabar whistling thrush, yellow-throated bulbul, peregrine falcon, rufous-bellied hawk-eagle. An endangered amphibian, Icthyophis ghytinosus has been reported in this sanctuary. Bhadra Wildlife Sanctuary: This is located between the Chikkamagaluru and Shimoga districts and is spread over 492.46 square kilometres (190.14 sq mi). Common species of flora include Lagerstromia lanceolata, Adina cordifolia and Careya arborea. Mammals include tiger, leopard, elephant, gaur, slender loris and pangolin. Among the bird species found here are ruby-throated bulbul, shama, Malabar whistling thrush and paradise flycatcher. Brahmagiri Wildlife Sanctuary: This is located in Kodagu district and is spread over an area of 181.80 square kilometres (70.19 sq mi). The evergreen forests in this sanctuary include species like Cinnamomum zeylancium, Cedrela toona and Alstonia scholaris. Bamboos are dominant here and include species like Bambusa bambos and Dendrocalamus strictus. Mammals include elephant, gaur, tiger, jungle cat, bonnet macaque and Nilgiri marten. Also around 300 species of birds have been observed here over the year kaveri Wildlife Sanctuary]]: It is spread across the districts of Bangalore, Mysore and Mandya and is spread over 1,027.53 square kilometres (396.73 sq mi). Dry deciduous trees found in this park include species like Terminalia arjuna and Syzgium cumini. Animal species found in this park include leopard, elephant, sambar and common otter. This is also one of the last refuge of the highly endangered grizzled giant squirrel in Karnataka. Also around 300 species of birds have been observed here over the years. This sanctuary is also famous for mahseer fish (Tor species). Dandeli Wildlife Sanctuary: This is located in Uttara Kannada district and is spread over 475.02 square kilometres (183.41 sq mi). Common tree species found here are Dalbergia latifolia, Terminalia paniculata, T. Tomentosa and Vitex altissima. Mammal species include elephant, gaur, wild boar, slender loris, Malabar giant squirrel and barking deer. Daroji Sloth Bear Sanctuary: This is located in Bellary district and is spread over 82.72 square kilometres (31.94 sq mi). This sanctuary was mainly created for the conservation of sloth bears. Malai Mahadeshwara Wildlife Sanctuary: Spread over 906 square kilometers (349.8 sq mi), MM Hills wildlife sanctuary came to being on 7th May 2013. Contiguous with BRT Tiger Reserve and Cauvery Wildlife Sanctuary, the sanctuary boasts of tiger, elephant, leopard, dhole, sambar, barking deer and others. The sanctuary is located in Chamarajanagar district, Kollegala taluk. Melukote Temple Wildlife Sanctuary: This is located in Mandya district and is spread over 45.82 square kilometres (17.69 sq mi). An endangered species of flora, Cycas circinalis is found here. Mammal species include wolf, leopard, blackbuck and pangolin. Also around 230 species of birds have been observed here over the years. Mookambika Wildlife Sanctuary: This is located in Udupi district and is spread over 370.37 square kilometres (143.00 sq mi). Some of the tree species found here are Dipterocarpus indicus, Calophyllum tomentosum and Hopea parviflora. An endangered species of climber Coscinium fenestratum has been recorded here. Slender loris, lion-tailed macaque, sambar and chital are some of the animals found here. The endangered cane turtle is also found here. Nugu Wildlife Sanctuary: This is located in Mysore district and is spread over 30.32 square kilometres (11.71 sq mi). Common species of flora include Emblica officinalis, Santalum album and Dendrocalamus strictus. Mammals include elephant, gaur, leopard, spotted deer and common palm civet. Pushpagiri Wildlife Sanctuary: This is located in Kodagu district and is spread over 102.59 square kilometres (39.61 sq mi). Some species of flora found here are Hopea parviflora, Schefflera capitata, Xanthalis tomentosa and Ochlandra rheedii. Mammals include elephant, tiger, slender loris, Nilgiri marten and bonnet macaque. Also around 230 species of birds have been observed here over the years. Bird species include great pied hornbill, Malabar trogon and Nilgiri blackbird. Ranibennur Blackbuck Sanctuary: This is located in Haveri district and is spread over 119.00 square kilometres (45.95 sq mi). Eucalyptus is the dominant species of trees found here. Cassia fistula, Prosopsis julifora and Zizyphus mauritania are other tree species found here. This sanctuary was created mainly for the conservation of blackbucks. This sanctuary is also a habitat for the endangered great Indian bustard. Sharavathi Valley Wildlife Sanctuary: This is located in Shimoga district and is spread over 431.23 square kilometres (166.50 sq mi). Dipterocarpus indicus, Caryota urens and Dillenia pentagyna are some of the species of flora found here. Tiger, leopard, mouse deer, bonnet macaque and common langur are some of the animal species found here. Snakes are commonly found here. Paradise flycatcher, racket-tailed drongo and blue-throated barbet are some of the bird species found here. Shettihalli Wildlife Sanctuary: This is located in Shimoga district and is spread over 395.60 square kilometres (152.74 sq mi). Cassia fistula, Kydia calycina and Wrightia tinctoria are some of the species of flora found here. Tiger, leopard, bonnet macaque and Malabar giant squirrel are some of the animal species found here. Someshwara Wildlife Sanctuary: This is located in Udupi district and is spread over 88.40 square kilometres (34.13 sq mi). Machilus macrantha, Lophopetalum wightanium and Artocarpus hirsuta are some of the species of flora found here. Tiger, leopard, lion-tailed macaque and spotted deer are some of the animal species found here. Talakaveri Wildlife Sanctuary: This is located in Kodagu district and is spread over 105.00 square kilometres (40.54 sq mi). Albizzia lebbek, Artocarpus lakoocha, Dysoxylum malabaricum and Mesua ferrea are some of the species of flora found here. Clawless otter, elephant, tiger, striped-necked mongoose and mouse deer are some of the animal species found here. Also around 300 species of birds have been observed here over the years. Fairy bluebird, Malabar trogon and broadbill roller are some of the avian species found. Attiveri Bird Sanctuary: This is located in Uttara Kannada district and is spread over 2.23 km2. white ibis, little cormorant, pied kingfisher, common grey hornbill are some of the bird species found here. Gudavi Bird Sanctuary: This is located in Shimoga district and is spread over 0.73 km2. The tree species that dominate this sanctuary are Vitex leucoxylon and Phyllanthus polyphyllus. 191 species of birds are recorded here including white ibis, pheasant-tailed jacana, purple moorhen and little grebe. Ranganathittu Bird Sanctuary: This is located in Mandya district and is spread over 0.67 km2. Among the tree species found here, is the unique Iphigenia mysorensis. Other tree species include Derris indica and Barringtonia racemosa. This sanctuary houses nearly 170 birds. Birds like cormorants, darter, white ibis, great stone plover, cliff swallow, spoonbills, lesser whistling teal roost here all through the year. Mandagadde Bird Sanctuary: It is located near the little village Mandagadde which is 30 km from the Shimoga town and is based on a small island on the Tunga River. It is mainly visited by migratory birds like median egret (Egretta intermedia), the little cormorant (Microcarbo niger), and the darter or snake bird (Aninga nufa). Kaggaladu Heronry: This is located in Tumkur district and is one of the largest painted stork sanctuaries in South India. Some of the birds that nest here are painted storks, grey herons, pelicans, black stilts and ducks. Kokrebellur Pelicanry: This is located in the town of Kokkare Bellur in Mandya district and is a haven for avian species like grey or spot-billed pelican (Pelecanus philippensis) and painted stork (Mycteria leucocephala). In fact the word Kokkare means stork in the Kannada language. Apart from pelicans and storks, 250 species of birds have been sighted here. Magadi Bird Sanctuary: Magadi Bird Sanctuary created at the Magadi tank, in Magadi village of Shirahatti Taluk, Gadag district. It is one of the Biodiversity hotspots of Karnataka, in North Karnataka. From Gadag it is 26 km, it is located on Gadag-Bangalore Road, from Shirahatti it is 8 km, and from Lakshmeshwara 11 km. Bar-headed goose is one of the bird migrates to Magadi wetlands of Gadag district. Normally birds eat fish, amphibians, molluscs, snakes etc., but migratory birds eating agricultural produce is both interesting and curious too. Winter habitat is on cultivation, it feeds on barley, rice and wheat and damage crops. Bankapura Peacock Sanctuary: This is located in Haveri district and spread over an area of 139.10 acres (0.5629 km2). This sanctuary was created mainly for the conservation of peacocks. Bonal Bird Sanctuary : This is located about 10 km from Shorapur city in Yadgir district. Ramadevarabetta Vulture Sanctuary: This is located in Ramanagara and is home of the critically endangered Long-billed vulture (Gyps indicus). Ghataprabha Bird Sanctuary: This is located in Belgaum district and is spread over 20.78 square kilometres (8.02 sq mi). This sanctuary is known for migratory birds like Demoiselle crane and European white stork. Due to various issues, flora and fauna in some parts of Karnataka are being threatened. These issues include poaching, human–wildlife conflict, habitat destruction, pollution and introduction of invasive new species. Despite the best efforts of conservation activists, poaching remains one of the serious problems affecting the flora and fauna in the state. Between the years 1997-2001, a total of 98 elephants have succumbed to poaching in Karnataka. Poaching has also affected the breeding of turtles like olive ridley on the beaches of Karnataka as well as otters on the river banks. 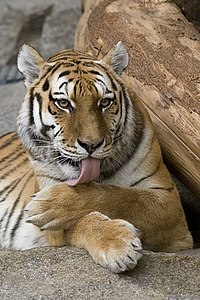 Tigers are also another species that are threatened to extinction by poachers. Sandalwood, famed for its sculptures and its aroma is frequently poached out of the forests of Karnataka. Teakwood, famed for the furniture is another species of flora affected by this problem. Staff-shortage, lack of adequate funds and unscientific anti-poaching camps are some of the reasons quoted for continued poaching activities. Construction of dams and reservoirs: Construction of dams causes widespread flooding of surrounding areas causing destruction of species that inhabit the area. They also affect the flow of riverine species like fishes and disrupt their normal habits. An example is the construction of the Linganamakki reservoir in Shimoga district that caused the extinction of the grass, Hubbardia heptaneuron. Destruction of forest land for agriculture and other purposes: large tracts of forest land have been cleaned up for monoculture plantations like teak, coffee and rubber. This has led to the destruction of species that were dependent on the forest. An example of this is loss of special habitats in Karnataka such as Myristica swamps and high altitude grasslands. In the dry zone, they have adversely affected several species dependent on large tracts of scrub such as the wolf and the great Indian bustard. Mining operations: Mining operations clear out large areas of land and cause destruction to the species dependent on them. An example is the Kudremukh Iron Ore Company Limited which mined iron ore within the boundaries of the protected Kudremukh National Park. Due to the loss of habitat, more and more species of fauna have started to venture into human habitation causing a conflict between humans and fauna. A typical species affected by this is the elephant which ventures out of the forest into human cultivations thereby eating or destroying the crops. In some cases, the elephants have also caused human deaths like an incident that happened in Hassan district where a villager was trampled to death. Precautionary measures (sometimes illegally) taken up by humans to prevent such mishaps like electric fencing have also led to disastrous consequences like electrocution of fauna. Release of industrial waste and human effluents into rivers have caused significant damages to species that reside in rivers and riverbanks. Air pollution is also a significant cause of concern in metros like Bangalore where it has been found that air pollution is discolouring foliage including those of ornamental plants. A comparison of the lichen flora of the garden Lal Bagh in Bangalore has revealed that 18 of the 22 species noted in 1980 were no longer present in 1997. Pollution in rivers like Kabini, Kaveri and Ghataprabha has caused sharp reduction in populations of bird species, including beneficial insectivorous birds like drongos, as well as honeybees. Introduction of new species into a habitat has caused serious consequences to the existing species of flora and fauna. A typical example is the introduction of the African catfish (Clarias gariepinus) in the lakes and rivers of Karnataka. This is a carnivorous fish and has caused serious damage to the indigenous fauna living in those lakes and rivers. Weeds like Eupatorium, Lantana and Parthenium have invaded large tracts of land causing destruction. An increase in Eupatorium is attributed as one of the causes for the spread of the deadly Kyasanur forest disease (which has a morbidity rate of 10%) among humans since it harbors tick populations that are vectors for this disease. Eucalyptus plantations in the Ranibennur blackbuck sanctuary have seriously harmed the extremely rare great Indian bustard. Various conservation activities are in progress to protect the biodiversity present in Karnataka. These activities are mostly done by the Forest Department of the State of Karnataka and other voluntary organisations. The presence of human habitation within the core area of reserved forests poses many problems like human–wildlife conflict and destruction of habitat due to agriculture and cattle grazing. Systematic efforts have been made to relocate some of this population into proper zones outside the protected area. An example is the relocation of some villagers from Bhagawathi and Nassehalla habitations within the Kudremukh National Park to safer regions outside it. Usage of satellites to detect forest fires so that they can easily be extinguished. Radio tracking of animals and usage of techniques like remote camera sampling to estimate the animal population. Installation of wireless stations and using wireless sets for easy communication among individuals involved in field trips and anti-poaching activities. Field kits were provided to the staff consisting of boots, rain gear and uniforms. Conservation related award programs were announced to boost the morale of the staff. Many areas of Karnataka, especially in the forests of Malnad region are unexplored and new species of flora and fauna are discovered periodically. Some of the new species of flora discovered in Karnataka include Paracautleya bhatii (a ginger) and Isachne veldkampii (a grass), both of which were discovered near Manipal in Udupi district. Two species of algae, Cosmarium bourrellyi and Cosmarium desikacharyi were discovered in a paddy field in Belgaum. Other new species of flora discovered in Karnataka include Isoetes udupiensis (a pteridophyte) and Pisolithus indicus (a fungus). Some of the new species of fauna discovered include two species of ants, Dilobocondyla bangalorica which was discovered on the campus of Indian Institute of Science, Bangalore and Discothyrea sringerensis which was discovered near Sringeri. Three new species of frogs; Philautus luteolus, Philautus tuberohumerus and Nyctibatrachus petraeus have been discovered in Karnataka. Explorations in the Sharavathi river have yielded new fish species like Batasio sharavatiensis (a bagrid catfish), Schistura nagodiensis and Schistura sharavathiensis. Another fish species, Puntius coorgensis has been discovered near Bhagamandala in the Kaveri river. Some other species of fauna discovered in Karnataka include two species of whiteflies, Distinctaleyrodes setosus and Aleurocanthus arecae and a caecilian, Gegeneophis madhavai. Explorations in the soil around the Linganamakki reservoir has revealed eleven new species of earthworms. Karnataka is the home of few critically endangered species of flora that include evergreen trees like Dipterocarpus bourdilloni, Hopea erosa and Hopea jacobi, Croton lawianus (a small tree) and Pinnatella limbata (a type of moss). Some of the critically endangered species of fauna found in Karnataka include Gyps indicus (the Indian vulture) and two species of frogs, Indirana gundia (found only in Gundia range, Sakleshpur) and Micrixalus kottigeharensis (found only near Kottigehara, Chikkamagaluru district). Some of the endangered species of flora include evergreen trees like Cynometra bourdillonii, Cynometra travancorica, Hopea glabra, Hopea parviflora, Hopea ponga, Hopea racophloea, Hopea wightiana, Shorea roxburghii and Tarenna agumbensis and flowering plants like Glochidion pauciflorum, Glochidion tomentosum, Ixora lawsoni and Syzygium stocksii. Other endangered trees found in Karnataka include Isonandra stocksii, Kingiodendron pinnatum, Maesa velutina, Myristica magnifica, Rapanea striata and Xylosma latifolium. Endangered species of fauna found in Karnataka include the Bengal tiger, Indian elephant, lion-tailed macaque, olive ridley turtle and dhole, the Indian wild dog. Many endangered species of amphibians are found here including frogs, Indirana brachytarsus, Microhyla sholigari, Minervarya sahyadris, Nyctibatrachus aliciae, Nyctibatrachus hussaini, Nyctibatrachus sanctipalustris, Philautus charius, Philautus wynaadensis, Ramanella mormorata and Rhacophorus lateralis and a toad, Bufo beddomii. Other endangered species of fauna include Hipposideros hypophyllus (the Kolar leaf-nosed bat) and Pseudomulleria dalyi (a mollusc). ^ a b Statistics related to forests in Karnataka is provided by "Statistics". Online Webpage of the Forest Department. Government of Karnataka. Archived from the original on 2007-09-27. Retrieved 2007-05-06. ^ Western Ghats being nominated by India as a World Heritage Site is mentioned by "Western Ghats (sub cluster nomination)". Online webpage of UNESCO World Heritage Centre. 1992-2007 UNESCO World Heritage Centre. Retrieved 2007-05-08. ^ "THE NILGIRI BIOSPHERE RESERVE". R.J. Ranjit Daniels - MS Swaminathan Research Foundation. UNESCO South-South Cooperation Program, 1996. Archived from the original on 2007-03-10. Retrieved 2007-05-10. ^ Flora and Fauna as state symbols of Karnataka are mentioned by "State Animals, Birds, Trees and Flowers" (PDF). Online webpage of Wildlife Institute of India. Government of India. Archived from the original (PDF) on 2007-06-15. Retrieved 2007-05-09. ^ A brief overview of Mandagadde bird sanctuary is provided by Pramod Mellegatti (2001-08-21). "Will floods prevent seasonal migration of 'alien' birds?". The Hindu. Retrieved 2007-05-08. ^ A description of Kokkare Bellur has been provided by Sharath S. Srivatsa (2006-02-15). "Lending a helping hand". The Hindu. Chennai, India. Retrieved 2007-05-08. ^ a b c d e f g A report on the environment of Karnataka and action plan thereof is discussed by Madhav Gadgil; et al. "Karnataka State of Environment Report and Action Plan, Biodiversity Sector" (PDF). ENVIS Technical Report 16. Environmental Information System, Centre for Ecological Sciences, Indian Institute of Science, Bangalore. Retrieved 2007-05-08. ^ a b Poaching of a tiger in Nagarhole National Park is mentioned by "Tigers falling victim to `poor' anti-poaching drive". The Hindu. Chennai, India. 2006-04-03. Retrieved 2007-05-08. ^ A brief description of mining at Kudremukh is provided by Praveen Bhargav & Niren Jain (2004-01-04). "Battle for Kudremukh". The Hindu. Chennai, India. Retrieved 2007-05-08. ^ Destruction caused by elephants in Hassan district is mentioned by S. Rajendran (2006-12-25). "State seeks Centre's nod for translocating elephant herd". The Hindu. Chennai, India. Retrieved 2007-05-08. ^ Electrocution of an elephant in Chamarajanagar district is mentioned by "Elephant electrocuted". The Hindu. Chennai, India. 2007-02-02. Retrieved 2007-05-08. ^ Air pollution in Bangalore discolouring plants in mentioned by Roja Kandath (2001-02-14). "Pollution is robbing blooms of their colour". The Times of India. Retrieved 2007-05-08. ^ Relocation of villagers from Kudremukh National Park has been mentioned by K. Ullas Karanth, Niren Jain and N. Samba Kumar. "Tiger Habitat Consolidation in Kudremukh" (PDF). A Final Report to 21st Century Tiger from the Wildlife Conservation Society (WCS). 21st Century Tiger. Archived from the original (PDF) on 2007-08-23. Retrieved 2007-05-08. ^ Using satellites for detecting forest fires in Karnataka is mentioned by "Eye-in-the-sky tech to combat forest fires". Deccan Herald. 2005-04-09. Retrieved 2007-05-08. ^ a b c Some conservation methods being used in Karnataka to protect flora and fauna are mentioned by Shekar Dattatri. "Tigers in India A chance for survival". Wildlife First. Retrieved 2007-05-08. ^ a b Discovery of Isoetes udupiensis has been mentioned by "New plant species found". The Hindu. Chennai, India. 2005-05-11. Retrieved 2007-05-06. ^ Discovery of new algae species is mentioned by U D Bongale. "New taxa of Cosmarium Corda (Desmidiaceae) from Karnataka State, India". doi:10.1007/BF00008169. ^ K. NATARAJAN; G. SENTHILARASU; V. KUMARESAN; TAIANA RIVIERE (25 June 2005). "Diversity in ectomycorrhizal fungi of a dipterocarp forest in Western Ghats" (PDF). Current Science. 88 (12). Retrieved 2007-05-07. ^ Discovery of a new species of ant in the IISc campus, Bangalore is discussed by THRESIAMMA VARGHESE (2006). "A new species of the ant genus Dilobocondyla (Hymenoptera: Formicidae) from India, with notes on its nesting behaviour Catalog of Fishes" (PDF). Oriental Insects. 40: 23–32. doi:10.1080/00305316.2006.10417454. Retrieved 2007-05-07. ^ Discovery of a new species of ant in Sringeri is discussed by Merry Zacharias & Priyadarshanan Dharma Rajan (2004). "Discothyrea sringerensis (Hymenoptera: Formicidae) a new ant species from India" (PDF). Zootaxa. 484: 1–4. Retrieved 2007-05-07. ^ Raviprasad Kamila (2007-02-20). "Two new species of frogs found". The Hindu. Chennai, India. Retrieved 2007-05-06. ^ INDRANEIL DAS AND KRUSHNAMEGH KUNTE (2005). "New Species of Nyctibatrachus (Anura: Ranidae) from Castle Rock, Karnataka State, Southwest India" (PDF). Journal of Herpetology. 39 (3): 465–470. doi:10.1670/198-04a.1. Archived from the original (PDF) on 2006-09-15. Retrieved 2007-05-07. ^ Discovery of Batasio sharavatiensis has been mentioned by Anuradha Bhatt & K.C. Jayaram (February 2004). "A new species of the genus BATASIO BLYTH (Siluriformes: Bagridae) from Sharavathi river, Uttara Kannada, Karnataka". Zoos' Print Journal. 19 (2): 1339–1342. doi:10.11609/jott.zpj.19.2.1339-42. Archived from the original (PDF) on 2009-10-26. Retrieved 2007-05-07. ^ Details regarding Puntius coorgensis is provided by Jayaram (1982). "Catalog of Fishes". Pisces Reference. Fishbase. Retrieved 2007-05-07. ^ Discovery of a new genus and species of whitefly is discussed by A.K. DUBEY & R. SUNDARARAJ (2006). "Distinctaleyrodes setosus Dubey & Sundararaj (Sternorrhyncha: Aleyrodidae), a new whitefly genus and species from India" (PDF). Zootaxa. 1154: 35–39. Retrieved 2007-05-07. ^ Discovery of a whitefly in areca plantations is discussed by B. VASANTHARAJ DAVID AND M. MANJUNATHA (2003). "A new species of Aleurocanthus Quaintance & Baker (Homoptera: Aleyrodidae) from Areca catechu in India, with comments on the status of Aleurodes nubilans Buckton" (PDF). Zootaxa. 173: 1–4. Retrieved 2007-05-07. ^ Discovery of a caecilian has been discussed by GOPALAKRISHNA BHATTA & R. SRINIVASA (2004). "A new species of Gegeneophis Peters (Amphibia: Gymnophiona: Caeciliidae) from the surroundings of Mookambika Wildlife Sanctuary, Karnataka, India" (PDF). Zootaxa. 644: 1–8. Retrieved 2007-05-07. ^ Discovery of new species of earthworms is mentioned by Julka; et al. "New species of earthworms found in Western Ghats of Karnataka" (PDF). Zootaxa. 486: 2. Retrieved 2007-05-07. Floral resources of Karnataka: A geographic perspective. Natural history of southern Karnataka: Ornithological perspective. This page was last edited on 14 March 2019, at 00:51 (UTC).